A latching relay is a two-position electrically-actuated switch. It maintains either contact position indefinitely without power applied to the coil. It is controlled by two momentary-acting switches or sensors, one that 'sets' the relay, and the other 'resets' the relay. The latching relay maintains its position after the actuating switch has been released, so it performs a basic memory function. One latching type has two opposing coils with an over-center spring or permanent magnet hold the contacts in position after the coil is de-energized. A pulse to one coil turns the relay on and a pulse to the opposite coil turns the relay off. Another latching type has a remanent core that retains the contacts in the operating position by the remanent magnetism in the core. 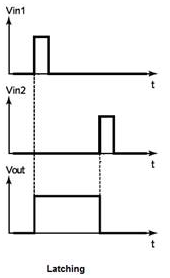 This type requires a current pulse of opposite polarity to release the contacts. A variation uses a permanent magnet that produces part of the force required to close the contact; the coil supplies sufficient force to move the contact open or closed by aiding or opposing the field of the permanent magnet. A pulse to one coil turns the relay on and a pulse to the opposite coil turns the relay off.